We recently had the opportunity to review the book Everyday Cooking by Vicki Bentley and published by Everyday Homemaking. Caty has been in Love!! 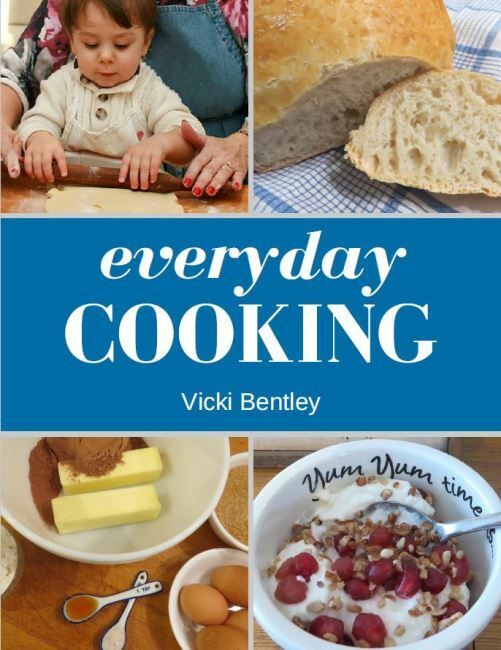 The Everyday Cooking ($15.99 PDF) by Vicki Bentley is a family cookbook is packed full of family favorite recipes and helpful tips for the kitchen. This 198-paged family-style book is filled with tried and true (and tested) recipes, stories and experiences. You not only get the recipes, but tips on shopping and lists to use. Our e-book was very simple to download in PDF format. The full color pictures looked great on the computer, but we could easily print any pages we desired (in either color or black and white). Included are full recipes with easy to read ingredients and instructions on making the dish. These "recipes" include meal options and even recipes on how to make items we use everyday such as Biscuit mix and even help for measuring ingredients. 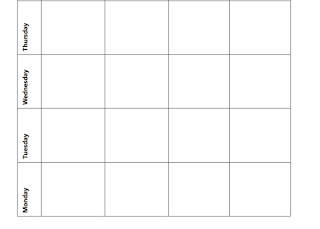 Helpful tips for planning meals are included. 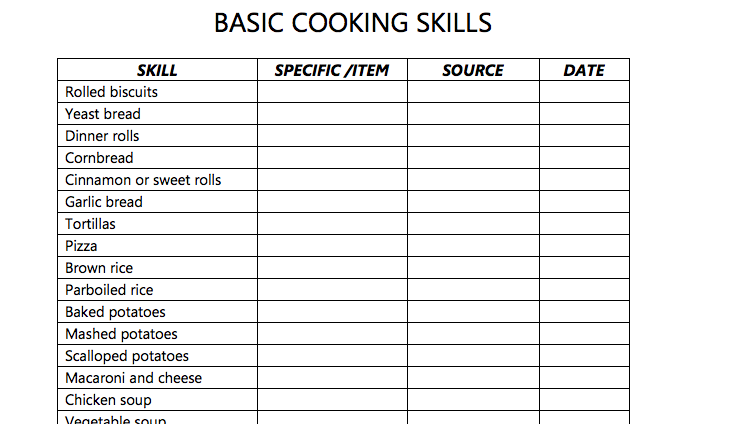 As well as easy to use meal planning sheets that you can print to fill out and post. 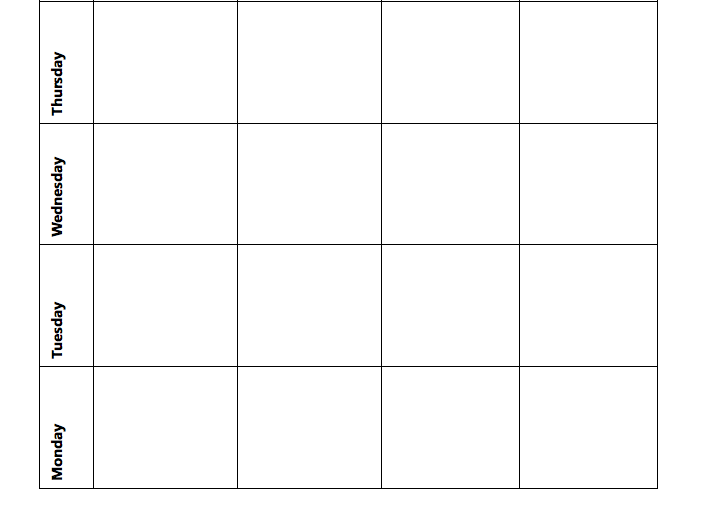 These helpful worksheets help to keep you organized, but also help you to plan healthy meals for your family that are not only good for you but also help you to work on your food budget easier. There is also a section that helps you to turn this informational cookbook into a study unit for your student. 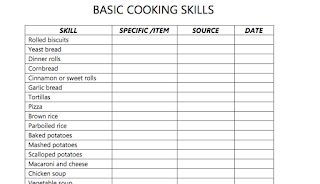 It lists out how you can easily get this requirement done in your child's education that helps them with ever important life skills like cooking. There's even a two page section on basic cooking skills that our children (and even ourselves) should know how to do or make. The recipe format is easy to understand and read. This is pretty important when younger children are learning to cook and want to be able to themselves. 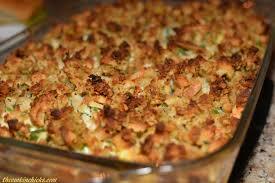 Caty loves cooking and the chicken and stuffing recipe was a favorite!! She has had no problems reading and following any of the recipes that we have tried so far. The biscuit recipe was very tasty and one the kids have asked for repeatedly. The breads and grains section is very interesting. She encourages one base recipe and then you can fix it according to what your family likes. So if they wanted yeast sweet rolls, you can fix those. But if you want savory, there are suggestions to adjust the yeast breads recipe to do that and several other suggestions. Ever hosted a buffet?? This is a skill that many of us learn after much practice. It takes many years of practice. Well, Vicki Bentley helps you out with buffet hosting tips. She gets you set up with many suggestions. The recipe set-up and all the tips and tricks (including measurements and substitutions) included really make me want to suggest this as a great starter cookbook for those kiddos moving out on their own or even a newlywed couple just setting up their homes. The price is great for a gift, since you can buy a print copy of Everyday Cooking for only $19.99. I'm glad we got the opportunity to try Everyday Cooking by Vicki Bentley. It's been a great addition to our emerging cooking kiddos. I even had some great reminders on recipes I haven't seen for a while and tips on how to eat healthy and planning/shopping. Several members of the Homeschool Review Crew were given the opportunity to try out Everyday Cooking by Vicki Bentley from Everyday Homemaking. Some even reviewed The Everyday Family Chore System. Visit the link below to see how they used these in their homes. That chicken recipe is a favorite in our house, too! Check out the photos in the Food album at our FB page to see how I "cheat" on my biscuits to make them even faster and more easily (hint: I skip the cutting and re-rolling part). Thanks so much for your thoughtful review.